Many of the area wildfires continued to burn yesterday and overnight. Many others have been declared under control, and many new fires erupted. Lampasas Co. firemen faced new challenges on Tuesday as, at 11:47am, they were dispatched to a grass fire 4.3 mi. east of Lampasas on Hwy 190. There they found a fast burning brush fire thought to take in about 6 acres initially. It was deemed the 190/Crawford Ranch fire but many locals were referring to it as the 4 Jacks area. It was actually on neighboring ranch land belonging to John Snell. Two Lampasas brush trucks were sent to the scene, assisted by one from the Kempner VFD. The fire was mostly controlled by local units, but the Forestry Service was brought in with 2 dozers to create a fire line. They also brought 4 brush trucks to squash the fire. The fire was small, only a few acres, but it was important because of houses in the area. It was declared under control by 4:59pm, though it was checked last night and some rekindle put out. Two witnesses say a cigarette was flipped from a vehicle to start the fire. One of them, a cement truck driver, stopped and attempted to put out the fire with water on the truck but couldn’t and the firemen were called. While the Crawford fire was being brought under control in the afternoon, firemen were called to a grass fire on CR 1301, near the “gap”, and less than a mile south of Hwy 183/190W at a point halfway between Lampasas and Lometa. Lampasas and Lometa firemen were called on to squash a 10 acre grass fire that lasted from 3:31pm to 4:07pm. It was small, estimated at 6 acres, and was caused by a fire in a burn barrel. Shortly after the above, at 4:53pm, firemen were called to a fire in the Lometa area along CR 2640 where 6-8 acres was burned. The fire was started by embers from a burn barrel. 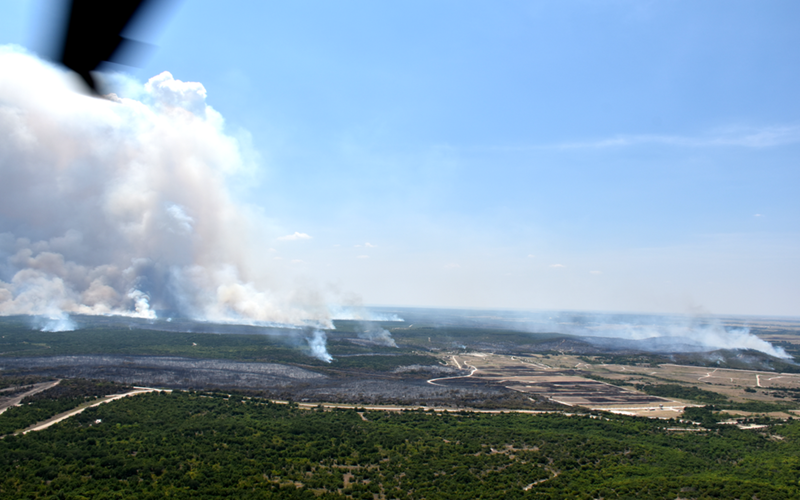 The CR 108 Fire in Burnet Co. several miles south of Lampasas has been declared 80% contained and took in 737 acres. The CR 259 Fire, in Brown Co., just across the county line from Mills Co. northeast of Zephyr, has taken in 1,658 acres and was last reported over the weekend as 80% contained. The Mills Co. Fire and the Harman Road Fire are now out. The Cotton Berger Operations fire in Coryell Co. but in the NE part of the Fort Hood Reservation was last reported by the Forest Service on Sunday as taking in 300 acres and was not contained at all. There are actually six different fires going on, as can be seen in this picture taken from a military helicopter. All the fires are in the north side of the reservation, generally on their firing range areas. The military is using dozers to create fire lanes and have six helicopters dropping water. Two roads through the western part of the post, West Range Road and Triple A Road, have been closed due to heavy smoke and poor visibility. However, a statement meant to calm fears of neighboring communities said, “Currently, the fire poses no immediate risk of leaving the installation boundary, nor does it pose an immediate threat to life or property.” Another message, this one from Copperas Cove Fire Chief, noted that smoke and ash was dropping from the sky in Cove, coming from the Fort Hood fires, but there was no danger from it. The Harman Road Fire is now said to be completely out, as is the FM2005 Fire in Mills Co. Caution is begged for again. Burn barrel use, cigarettes out windows, welding machines and grinders are the most common things we’ve heard of that start these fires. These are human carelessness. Please be careful.